This site has been built to acknowledge the proposed new word levidrome, which was coined by 6 year old Levi Budd. Here is a video of Levi and his quest. The word Levidrome is comprised of two parts. Levi, from the name of the creator of this word and drome as an analogy to the word palindrome. Another origin of the word can be more scientific, which is what Webster may be looking for. Keep on reading for the full explanation. A levidrome is a word that spells another word when spelled backwards. It does not fall into the definition of a palindrome. But if you look online for that definition, nothing fits. The closest fit would be emordnilap, which is palindrome spelled backwards, or even semordnilap (palindromes backwards). Although these suggestions have been around for years, they never took off and are not recognized by the popular dictionaries. So currently, there is no generally accepted term. The Webster Dictionary is "The Voice of Authority" for English words. 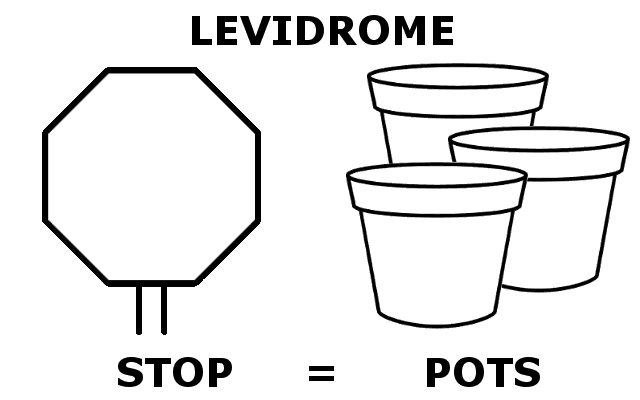 Here at Levidrome List we acknowledge the word Levidrome and we are an authoritative site for all words which are levidromic. Check out our English words section for all levidromic words. We are also compiling lists in other languages as well. Palindromes are the same spelled forwards and backwards. Nonsense or made-up words could have a palindrome associated with it, such as "awwatawwa". Even numbers can be palindromes, such as "1221". Since palindromes include numbers there are millions upon millions of palindromes. Levidromes are different. Levidromes are always paired. Levidromes are paired with their levidromic word, and both words are valid dictionary words each with a different meaning. Levidrome sentences are harder to put together than palindrome sentences, because palindrome sentences strategically place the space as a character (for example "Do geese see god" which is actually "dogeeseseegod", but with spaces to make valid words). It appears that all levidrome sentences will also be palindromic, except proper palindromes. (ie. proper use of spaces). If you have any ideas for sentences, please contact us with ideas. We are not including isometric palindromes, because it goes against the definition of a levidrome. For example, REFER is palindromic, but not levidromic, because its pair is not a new word. Why should a Levidrome Be Included as a Valid Word with Webster Dictionary? As mentioned above, there are millions of palindromes. There are only a few thousand levidromes. From Latin, "Lev" means "light in weight". So in orders of magnitude, thousands is definitely "lighter in weight" than millions. The "drome" comes from Palindrome, because of the backward spelling. The word "Levidrome" is a good fit from a Latin origin perspective. However, levidrome has its founder, Levi. Levidrome is an eponym for Levi. Let's make this happen. What is the definition of Levidrome? (noun) A word with a new definition when the spelling is reversed. Looking for a complete list of levidromes? Levidrome Lists has extensive lists in many languages. We also have a collection of levidrome games and puzzles. A cool tool to help you find levidromes in you documents.